Dehradun has lots of tourist places for visit. During summer for one time visiting Robber's cave or Guchu Pani is the best option where you can enjoy a lot. Dehradun local people go there for celebrating the picnic during the summer season. But for outsider tourists, it is the one-time tourist destination. I visited this place only two times during summers. Robber's cave is actually a river cave where you can see the small waterfalls also. Dehra plateau has many conglomerate limestone areas in Dehradun. You can see similar caves in Sahastradhara also. Robber's Cave is a good example of the narrow gorge formation in conglomerate- limestone due to the flow of rivulet. This natural cave worked as Robbers Refuge. As per saying, very famous Dacoit Sultana and his gang used this cave to hide. As per saying during the late 1800s, this cave is used by robbers to hide them from Britishers. Due to the natural and local location of this cave, it is best for robbers to hide them here. There were many reasons why robbers used this cave to hide. There are lots of space inside the cave, fresh water available, a natural corral for keeping their horses etc. 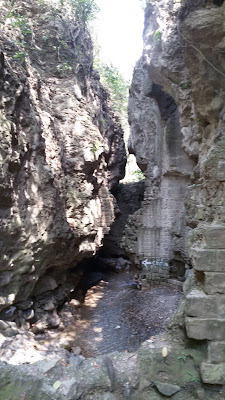 It is believed there was a small fort which is used by robbers to stay there but now it is broken due to water and natural reasons and only some parts are available to see. If you go there you can see it better and understand what the real condition was during that time. For many decades it is used by robbers to stay here so this place becomes popular with the name of Robbers Cave. But now it is also popular with another name as Gucchu Pani. If you travel till the end of the Robbers cave you will find the starting point of this rivulet water. The way is not easy to reach and you have to go upwards in direction. In the end, you will find a small river whose water flowing in the Gucchu Pani. This flowing water made this beautiful cave. At the end of Robbers Cave, only a few tourists go there to see the origin of this beautiful cave. The water level of this river will be low during summer but increased during the rainy season heavily. Gucchu Pani everyday open in the morning 7 am to evening 6 pm. The maximum time required to visit Robber's Cave will be 2-3 hours only but you can enjoy the full day picnic here with your friends or family members. Since the cave remains darker during evening and morning so try to visit it during the daytime. 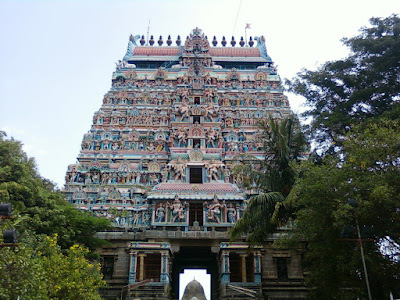 Best time to visit this place will start at 10:00 am and end at 04:00 pm. Gucchu Pani will be best to visit during the summer season. You can go there from March to June but avoid the rainy season. 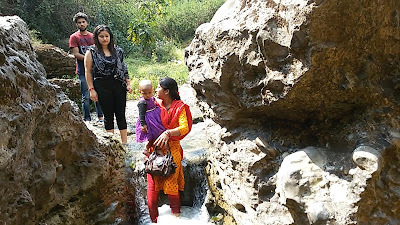 During the winter season, the environment of Dehradun get chilled and water also becomes colder. During rainy and monsoon season water level will be increased and becomes muddy. In the rainy season, the water level can be suddenly increased and you may be in trouble. Initially, Robbers caves entry was totally free, there were no entry tickets for anyone. But later on, when the government starting Gucchu Pani renovation and developing it as a tourist place they started the entry fee for everyone except kids. The Robbers Cave entry ticket when I visited this place was Rs. 25/- per person. Initially, the ticket price was Rs. 20/- per person. Gucchu Pani has the shallow water level. Maximum water will touch your knee. There is no fear to drown in the water. Here small kids and woman can enjoy fearlessly. Water is clear and transparent so anyone can see them if anyone by mistake falls in the water. Robbers cave is more than half kilometer long and full of natural beautiful scenarios. There is a small ten-meter long waterfall also where you can take bath also. Where you can enjoy snacks Maggie etc. You can take photos with loved ones or selfies at various places in Robbers cave for sharing on social network. You will find here many tourists from other cities and states. More than thousands of tourists come daily at Gucchu Pani daily during summer. Many tourists come to Robbers Cave for trekking and camping. 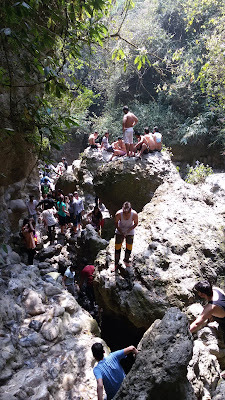 Tourists can experience adventurous trekking by climbing on the cave. The cave is full of natural beauty. If you plan to bath there you can carry an extra set of clothes. Try to wear rubber slippers because you have to walk in running water. I will recommend to you don't plan to travel at Gucchu Pani during the rainy season. Keep your electronic items safely with you if it fell down it may be damaged by water. As per my experience, I would suggest some points to keep you when you plan to go there. Robbers cave is too narrow at some places and dark. So you can plan to go there in a clean and shiny day. You will get snacks there like Maggie and momos but if you want some healthy and hygienic foods you can carry with you. You have to carry a water bottle also. If you have a good camera such as DSLR at home, you must carry with you. There are lots of amazing locations for photography. If you have small kids with you, keep kids hands with you. The way of Robbers Cave has small stones, pieces of glass and sharp things. If kids fell down they can get damaged. The water level of Robbers Cave not equal everywhere. So move slowly in water because you don't know the exact depth of water. Locker facility for keeping goods. There is a clock room for keeping luggage. There is a parking facility for two and four wheelers. There are many shops of snacks, food, tea, and coffee. There is the changing room facility for changing clothes. Slippers are available for rent at Rs.10/- only, for walking in Gucchu Pani. There are also paid swimming pools for those who want to enjoy swimming there. Gucchu Pani is approximately 9 km far from the Dehradun railway station, 14 km from the ISBT Dehradun and 8 km from the Ghanta Ghar (clock tower). You will easily get the city bus and Vikram for going to Gucchu Pani. If you want to go by city bus then you have to go Parade ground near Ghanta Ghar. The bus fare was at that time Rs. 10/- only for per person. The distance between Dehradun's Jolly Grant Airport and Gucchu Pani is approximately 33 km. From here you can take a cab or a private taxi. The nearest city bus stoppage is at Anarwala. But both drop you at their stoppage and you have to go Gucchu Pani by foot approx. half km. 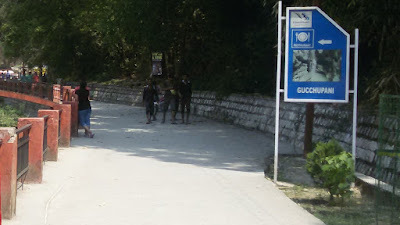 Entrance gate of Gucchu Pani comes after crossing a small village from the bus stoppage. So it's better to book a cab or taxi which will drop you at the entrance gate of the Gucchu Pani. Gucchu Pani is very famous in Dehradun so if you asked anybody they will tell you the address of the Gucchu Pani very easily. For your convenience, I mention here the address of the Gucchu Pani so you can go there easily. 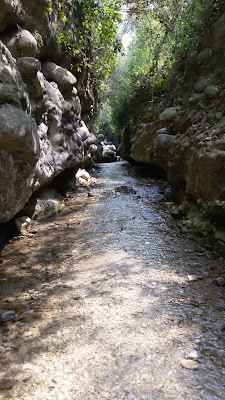 Gucchupani, Malsi, Near Vijepur, Gopiwala, Anarwala Dehradun, Uttarakhand, India 248003.